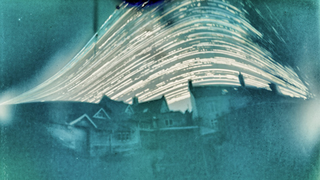 When UK photographer Matt Bigwood took a workshop in pinhole photography, he was inspired to create his own, simple project. So, armed with some empty beer cans and a roll of tape, he set out to make a camera. The cans had 5x7-inch pieces of photographic paper inserted into them, a pinhole made in the front, and any other holes sealed with tape. The kit, if you can call it that, is pictured below. Then Quinnell fastened the, um, cameras to fences to try and snap a picture of a building—and left them for six months.